Ishmael Reed has devoted his life to uncovering the neglected cultural and historical record of the United States, no matter how ugly it might be. He uses a full-court press: fiction, poetry, plays, songs, films, interviews, essays, and more. 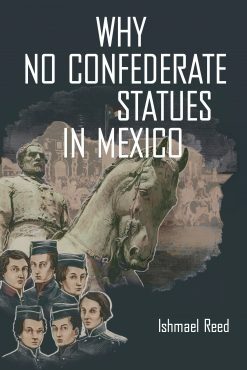 With Why No Confederate Statues in Mexico, Reed is at his best: insightful, hard-hitting, eclectic, refreshing, caustic, entertaining, informative, and, yes, funny. The Civil War still divides the United States. The president and millions of southerners wish to maintain monuments to generals like Robert E. Lee. Yet those who fought under them ran away by thousands. Some rebel generals, whom the excellent propaganda film Gone with the Wind referred to as “Knights,” earned their bona fides by murdering blacks, Mexicans, and Native Americans. The “Knight” Robert E. Lee fought children during the Battle of Buena Vista in 1847. The children, Los niños heroes, (pictured on the cover) refused to surrender and were slaughtered by these noble Knights. Ishmael Reed tackles a vast and varied set of subjects. They include the billion-dollar show Hamilton and its designer Lin-Manuel Miranda, the ‘Black Bogeyman’ scam, the one-at-a-time tokenism of an elite who chooses winners and losers among minority artists, Quentin Tarantino and Django, Amiri Baraka/Leroi Jones, white nationalism, Donald Trump, the Alt-Right, the use of immigrants to shame black America, and much more. After The Complete Muhammad Ali, recognized by many as the “truly definitive book” on the champion, Ishmael Reed is back with another exciting book of essays that will stir up debate in the United States and abroad. Ishmael Reed is a poet, novelist, essayist, and songwriter. He has won prizes and grants in each category. He is also an illustrator and Jazz pianist. His most recent awards include the Alberto Dubito Award for International Poetry, presented at the Ca’Foscari University in Venice in 2016 and The AUDELCO award for theater presented in 2017. In 2019, he began his 36th year as a professor at The University of California at Berkeley. He also teaches at the California College of the Arts where he is a distinguished professor. He is author of The Complete Muhammad Ali (Baraka, 2015).